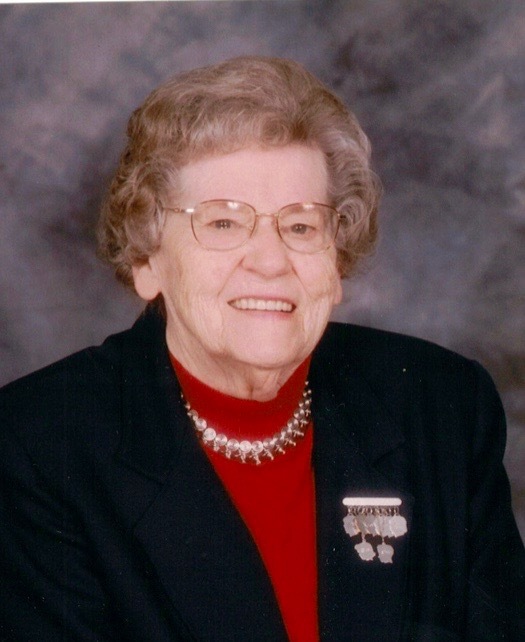 Mae E. Berger, 97, formerly of Wayne Twp., passed away Tuesday, November 27th, at Luther Ridge, Pottsville, where she had been a resident for almost six years. Born in Berks County, PA on June 20, 1921, she was a daughter of the late Jacob & Gussie (Kiefer) Drumheller. She was the widow of Wayne L. Berger. In addition to her parents and husband, Mae is also preceded in death by her son, Kenneth Berger, sisters: Ruth Smith, Grace Stengle, & Joan Sojtori, and brother, Ralph Drumheller. She was a member of St. John's Evangelical Lutheran Church of Friedensburg. Mae is survived by a daughter, Linda Schropp & husband, Roger, Oley, PA, six grandchildren, six great-grandchildren, and a sister, Molly Veramonti, Chester County, PA.
Mae was a caring wife and mother with a hearty laugh especially when eavesdropping on a humorous converation at the next table.She had no problem joining in their laughter. A Celebration of Life Funeral Service will be conducted at St. John's Evangelical Lutheran Church of Friedensburg at 11 a.m. on Saturday, December 1st, with Pastor Peggy Sue Pfeffer officiating. A viewing will be held at the church on Saturday from 10 a.m. until the time of service. Interment will immediately follow the funeral service at the church cemetery, St. John's Union Cemetery.